Home→Global Action/Inaction→IPCC What is it? Why did the IPCC produce this special report? How far away is 1.5C of warming? How do the impacts of climate change compare between 1.5C and 2C? How quickly do emissions need to fall to meet the 1.5C limit? What would it take to limit warming to 1.5C? What does the report say about the remaining carbon budget for 1.5C? What role will ‘negative emissions’ play in limiting warming to 1.5C? Could ‘solar geoengineering’ play a role in meeting 1.5C? What are the costs and benefits of meeting the 1.5C limit? Will the world be able to adapt to 1.5C and beyond? What are the links between 1.5C and poverty? Gavin’s response to the question – Can we avoid going through 1.5ºC?IPCC has to use a few circumlocutions to avoid giving a direct answer to this question (for reasonable and understandable reasons). I’m not quite so constrained… There are many issues related to the feasibility question of which physical climate-related issues are only one. The basic issue is that the effort to reduce emissions sufficiently to never get past 1.5ºC would require a global effort to decarbonize starting immediately that would dwarf current efforts or pledges. This seems unlikely (IMO). There are a few ‘get-out-of-jail’ cards that are considered. First, we can overshoot 1.5ºC, and then come back down after heroic efforts to reduce CO2 levels in the atmosphere though so-called ‘negative emissions’. This makes the immediate task less daunting, but at the expense of relying on global scale efforts with carbon sequestration, or BECCS, or direct air capture, which are extremely speculative. Second, we could start direct geo-engineering efforts to reduce temperatures and (most optimistically) buy time for carbon emissions to come down a little more slowly. Both of these scenarios come with dramatic and underexplored geo-political consequences (are there any stable governance regimes for geo-engineering? is there sufficient land for large scale BECCS? ), as well as substantial moral hazard. So my answer is… no. I get that there is reluctance to say this publically – it sounds as if one is complicit in the impacts that will occur above 1.5ºC, but it seems to me that tractable challenges are more motivating than impossible (or extremely unfeasible) ones – I would be happy to be proven wrong on this though Read on for more of his response or to read his full response, access here. FAQ 1.1: Why are we talking about 1.5°C? FAQ 1.2: How close are we to 1.5°C? FAQ 2.1: What kind of pathways limit warming to 1.5°C and are we on track? FAQ 2.2: What do energy supply and demand have to do with limiting warming to 1.5°C? FAQ 3.1: What are the impacts of 1.5°C and 2°C of warming? 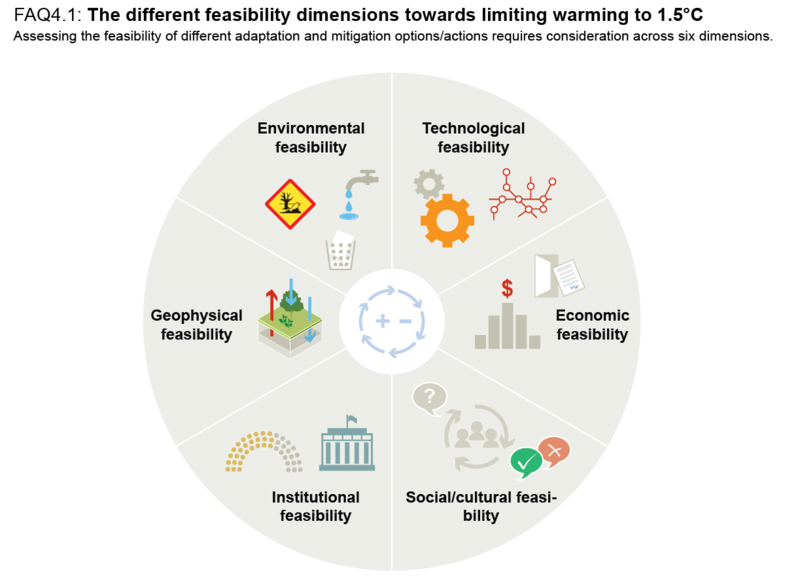 FAQ 4.1: What transitions could enable limiting global warming to 1.5°C? FAQ 4.2: What are Carbon Dioxide Removal and negative emissions? FAQ 4.3: Why is adaptation important in a 1.5°C warmer world? FAQ 5.1: What are the connections between sustainable development and limiting global warming to 1.5°C? FAQ 5.2: What are the pathways to achieving poverty reduction and reducing inequalities while reaching the 1.5°C world? While it may be true that global warming threatens economic growth, it is far more salient to say that economic growth threatens us with global warming. The Intergovernmental Panel on Climate Change (IPCC) is an intergovernmental body whose governing Panel is made up of government members representing 195 countries. But the Assessment Reports the IPCC produces are drawn up by a very large, global group of scientists and experts who contribute their time in drafting and revising and reviewing. It was established by the United Nations Environment Programme (UNEP) and the World Meteorological Organization (WMO) in 1988 to provide the world with a clear scientific view on the current state of knowledge in climate change and its potential environmental and socio-economic impacts. It reviews and assesses the most recent scientific, technical and socio-economic information produced worldwide relevant to the understanding of climate change.These reports bring together the best of the recently published scientific and technical literature. It does not conduct any research nor does it monitor climate related data or parameters. It is intended to be “policy relevant but not policy prescriptive”. NOTE: The IPCC is however, not ‘owned’ by the research community. It is owned by the governments of the world (the ‘Intergovernmental’ part of the name) and the Summary for Policymakers in particular is trawled over word by word by those governments. Whatever the research community writes in IPCC report drafts, it can be changed by the governments. In practice this is only likely to happen in the Summary for Policymakers and through this the Executive Summaries of the chapters, rather than the chapter text itself. Also as new research is continually evolving, the long process of developing the reports ensures that it can be years out of date at time of approval. This is then compounded by the 7 years between reports. The IPCC is organised into three Working Groups and a Task Force. Working Group I deals with “The Physical Science Basis of Climate Change”, Working Group II deals with “Climate Change Impacts, Adaptation and Vulnerability”, and Working Group III deals with “Mitigation of Climate Change”. The Task Force refines the methodology for the calculation and reporting of national greenhouse gas emissions and reductions. All these groups have two co-chairs, one from a developed country and one from a developing country. The final reports from these working groups are collectively known as an “Assessment Report”. The IPCC have already produced 5 Assessment Reports with the 6th Assessment Report (AR6) to be completed 2020-21. Draft, review, draft, review – you did ask! Governments and other bodies nominate potential IPCC authors who are experts in their field, and are selected also to try and produce a geographical and gender balance. Groups of around 10-20 experts prepare individual chapters covering their area of expertise. The first step in bringing these chapters together to form an assessment report starts when authors and co-chairs meet to develop a Zero Order Draft, which will take about three months, perhaps involving additions from invited Contributing Authors. The draft is then distributed to a small number of reviewers, who for each chapter provide feedback on how well the structure and proposed content works. The next step is to prepare a First Order Draft, which is distributed for expert review. At this stage anyone can self-nominate as an “expert”, if they can justify their credentials and expertise, and on condition that they agree to adhere to the rule of confidentiality, so there are no leaks of early drafts. Several months are allowed for expert comments, which are individually identified and linked to the expert offering them. The First Order Draft of Working Group I for forthcoming AR5 report for example received 21,400 comments from 659 experts. The authors respond to each of the comments, and these responses are also tagged and recorded. A Second Order Draft is prepared based on review comments, including a Summary for Policymakers (SPM) that summarises the most important conclusions. This draft is returned to the experts for another review, and also to government panel members for their comments. The AR5’s Second Order Draft for Working Group I received 31,422 comments from about 800 experts and 26 governments. At this stage we approach the cut-off date for scientific literature that can be cited in the report, usually about six months before the final Plenary meeting where the document is approved. Authors meet again to consider the comments on the Second Order Draft, and to start preparing the Final Draft. This, once ready, is passed to government members for a final review. The final author meeting is held immediately prior to a Working Group Plenary and responds to government comments on the final draft. The revised draft is then taken into the Working Group Plenary for discussion and, ultimately, approval. The Summary for Policymakers is discussed and approved line-by-line and, if necessary, word-by-word. Lead Authors explain and defend their chapter’s contributions. If there is a dispute, a smaller group may be established to refine the language. The role of the Plenary is to ensure what ends up in the document governments will read is appropriate and clear, but still accurately reflects the science. The Working Group Plenary will then accept the report made up of the chapters prepared and reviewed by authors and approve the final Summary for Policymakers. This usually happens in the early hours of the morning after the final of four days of tough negotiations between all parties, and generally only a few hours before a scheduled launch press conference. What does the IPCC have to do with UNFCCC, aka global climate change talks and agreements?? For more than 20 years the IPCC process has managed to assimilate the rapidly expanding scientific literature about climate change, and summarise it for those that need to know. e.g. UNFCCC. The interest shown in the IPCC reports illustrates how important these Assessments have been in trying to keep track of and understand what the science tells us. And the unique if long winded IPCC process – open, transparent, and involving as many relevant parties as possible – is why its work is respected. The 43rd Session of the IPCC held in April 2016 agreed that the AR6 Synthesis Report would be finalized in 2022 in time for the first UNFCCC global stocktake when countries will review progress towards their goal of keeping global warming to well below 2 °C while pursuing efforts to limit it to 1.5 °C. Special Report on the Ocean and Cryosphere in a Changing Climate (SROCC). At its 43rd Session (Nairobi, Kenya, 11 – 13 April 2016), the IPCC decided to prepare a special report on climate change and the oceans and the cryosphere. During its 45th Session (Guadalajara, Mexico, 28 – 31 March 2017), the Panel approved the outline of the Special Report on the Ocean and Cryosphere in a Changing Climate to be finalized in September 2019. Special Report on Climate Change and Land (SRCCL) At its 43rd Session (Nairobi, Kenya, 11 – 13 April 2016), the IPCC decided to prepare a special report on climate change, desertification, land degradation, sustainable land management, food security, and greenhouse gas fluxes in terrestrial ecosystems. At its 45th Session (Guadalajara, Mexico, 28 – 31 March 2017), the Panel approved the outline of Climate Change and Land: an IPCC special report on climate change, desertification, land degradation, sustainable land management, food security, and greenhouse gas fluxes in terrestrial ecosystems. The report will be finalized in September 2019. The decision to prepare a Fifth Assessment Report (AR5) was taken by the members of the IPCC at its 28th Session (09-10 April 2008, Budapest, Hungary). The final reports were published throughout 2013/14. The IPCC has delivered 5 reports since 1990. Each Summary for Policymakers is written by a team of scientists and reviewed by experts and government representatives as part of the second draft of the Working Group report. Government representatives then meet and negotiate an agreement of the final wording line by line. This process is intended to result in language that can be understood by policymakers and to increase the chance that governments will ‘buy in’ to the key conclusions of the assessment. This however raises concerns that reinterpretation of the assessment’s findings, suggested in the final Plenary might be politically motivated. As these negotiations can also take several days and commonly end in an all night session it can give the impression that individuals with the most endurance or the countries that have large delegations can end up having the most influence on the report. Source: Evaluation of IPCC’s Assessment Process. A place where the non-scientific person can flounder in ignorance and boredom. But knowing the basics is essential in understanding what the science is saying. The current AR5 bases its findings on a new set of scenarios that replace the Special Report on Emissions Scenarios (SRES) standards employed in the two previous reports. The new scenarios are called Representative Concentration Pathways (RCPs). There are four pathways: RCP8.5, RCP6, RCP4.5 and RCP2.6 – the last is also referred to as RCP3-PD. (The numbers refer to forcings for each RCP; PD stands for ‘Peak and Decline‘). RCP 6 Stabilisation scenario in which total radiative forcing is stabilised shortly after 2100, without overshoot, by the application of a range of technologies and strategies for reducing greenhouse gas emissions (Fujino et al. 2006; Hijioka et al. 2008). RCP 4.5 Stabilisation scenario in which total radiative forcing is stabilised shortly after 2100, without overshooting the long-run radiative forcing target level (Clarke et al. 2007; Smith and Wigley 2006; Wise et al. 2009). If you are now totally confused either go to the following links for more detail: The Beginners Guide to Representative Concentration Pathways; Scenario Process for AR5. Note that the RCP’s will be soon superceded by the SSP’s – see below. Also REMEMBER when you are reading any scientific reports using these scenarios the world is currently tracking at the highest emission rate scenario RCP 8.5. They are also now (2018) needing much updating to align with current observational data. Another important point is that models are all based on a range of assumptions and these may not necessarily correspond to the real world. BIG NOTE: Change is afoot! Over the past few years, an international team of climate scientists, economists and energy systems modellers have built a range of new “pathways” that examine how global society, demographics and economics might change over the next century. They are collectively known as the “Shared Socioeconomic Pathways” (SSPs). These SSPs are now being used as important inputs for the latest climate models, feeding into the Intergovernmental Panel on Climate Change (IPCC) sixth assessment report due to be published in 2020-21. They are also being used to explore how societal choices will affect greenhouse gas emissions and, therefore, how the climate goals of the Paris Agreement could be met. These scenarios are based on narratives. These narratives describe alternative pathways for future society. They present baselines of how things would look in the absence of climate policy, and allow researchers to examine barriers and opportunities for climate mitigation and adaptation in each possible future world when combined with mitigation targets. SSP1 and SSP5 envision relatively optimistic trends for human development, with “substantial investments in education and health, rapid economic growth, and well-functioning institutions”. They differ in that SSP5 assumes this will be driven by an energy-intensive, fossil fuel-based economy, while in SSP1 there is an increasing shift toward sustainable practices. SSP3 and SSP4 are more pessimistic in their future economic and social development, with little investment in education or health in poorer countries coupled with a fast-growing population and increasing inequalities. SSP2 represents a “middle of the road” scenario historical patterns of development are continued throughout the 21st century. The SSPs were designed to reflect worlds in which mitigation and adaptation challenges vary from low to very high. While the baseline SSP scenarios assume an absence of climate policy, researchers also wanted to look at how the underlying socioeconomic conditions would affect the implementation of climate policy. For more details go here. How more complicated can it get!! When the IPCC scientists use the terms ‘confidence’ and ‘likelihood,’ each term has a different and very specific meaning relating to levels of certainty. When scientists mention ‘confidence’, they are referring to the degree of confidence in being correct. In the case of the IPCC where scientists are analysing global climate, issues such as lack of observational data in certain regions, such as Africa, will affect scientists’ confidence in their findings. When scientists mention ‘likelihood’ they are referring to the probability of an event or outcome occurring. If an event is given a very high confidence level, there is a combination of high agreement and robust evidence that it will occur. If an event is virtually certain, there is a greater than 99% probability that it will occur. You would think it’s a no brainer to put into place some proactive risk management when faced with the odds above. The atmospheric concentrations of carbon dioxide, methane, and nitrous oxide have increased to levels unprecedented in at least the last 800,000 years. Carbon dioxide concentrations have increased by 40% since pre-industrial times, primarily from fossil fuel emissions and secondarily from net land use change emissions. The ocean has absorbed about 30% of the emitted anthropogenic carbon dioxide, causing ocean acidification. Limiting climate change will require substantial and sustained reductions of greenhouse gas emissions. This is evident from the increasing greenhouse gas concentrations in the atmosphere, positive radiative forcing, observed warming, and understanding of the climate system. It is extremely likely (95-100% probability) that human influence has been the dominant cause of the observed warming since the mid-20th century. Continued emissions of greenhouse gases will cause further warming and changes in all components of the climate system. Limiting climate change will require substantial and sustained reductions of greenhouse gas emissions. Global surface temperature change for the end of the 21st century is likely to exceed 1.5°C relative to 1850 to 1900 for all RCP scenarios except RCP2.6. It is likely to exceed 2°C for RCP6.0 and RCP8.5, and more likely than not to exceed 2°C for RCP4.5. Warming will continue beyond 2100 under all RCP scenarios except RCP2.6. Warming will continue to exhibit interannual-to-decadal variability and will not be regionally uniform. ….very likely that the Arctic sea ice cover will continue to shrink and thin and that Northern Hemisphere spring snow cover will decrease during the 21st century…global glacier volume will further decrease. ….global mean sea level will continue to rise during the 21st century. Under all RCP scenarios, the rate of sea level rise will very likely exceed that observed during 1971 to 2010 due to increased ocean warming and increased loss of mass from glaciers and ice sheets. ….continuing uptake of carbon by the ocean will increase ocean acidification. Will the AR6 say anything different? ?